Marylou DiPietro wears many hats. A self-starter with unbridled creative vision, she’s a published poet and writer, playwright, mosaic artist, wife and mother. And, to add to the list, she’s tapped into her entrepreneurial reserve and has embarked on a journey into the world of fashion. 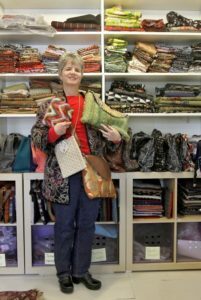 It’s a Wednesday morning at DiPietro’s Reincarnations Fiber Art Studio in Harrisville, and there’s no shortage of used clothing in the room. In fact, it’s everywhere: an old biker jacket, a faux fur leopard-print pea coat, a black satin cocktail dress, a houndstooth-patterned sport coat, even a wetsuit. But, the clothing isn’t hanging on hangars or neatly folded on a shelf. It’s more of a deconstructed, mixed display that is far more interesting, compelling and enticing.